Developers use data visualization as a tool to express the insight into the data. We usually target the outside audience by creating tools that allow others to analyze the data. There are also visualizations of software artifacts, like code complexity graphs created by the Plato tool. Yet, we do not use data visualization tools during one of our primary work activities - debugging web applications. What if we could inspect variables not by printing them to the browser console, but instead by plotting and interacting with them? What if we could do this right inside the browser without going to external website or using another tool? What if we could plot data during debugging right inside the Chrome DevTools? I wrote Chrome browser extension d3-panel. It creates a new tab in DevTools, and allows you to send data directly from the browser console to plot and interact. 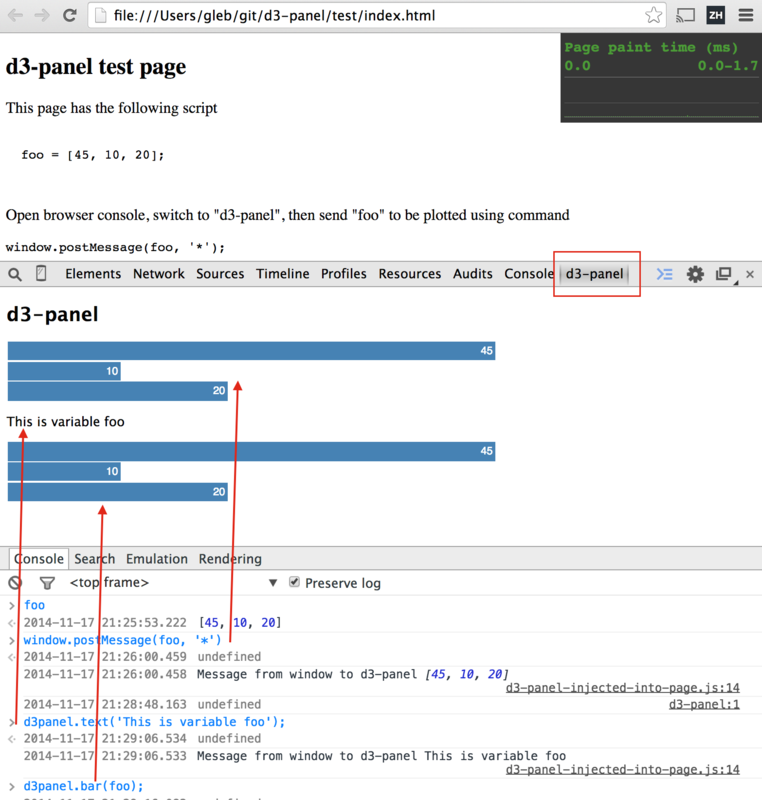 For example, if my main page has a variable foo, I can send it to d3-panel to be plotted using a bar chart. Each new chart is appended to the bottom of the panel, you can use command d3panel.clear(); to remove everything. I plan to investigate and find chart types useful during debugging my web applications. The Chrome extension itself will be published soon to the Google Web Store.